The Majestic Grille is a deceptive little place. From the looks of it, it’s an upscale, fancy, expensive kind of place, the kind you’d reserve for a special occasion. In reality, it would be a mistake to only think of the Majestic that way. Yes, the restaurant – which is housed in one of Memphis’ first movie houses -oozes class, but the menu is full of unpretentious classics like sandwiches, steaks and salads. Everything is also way more reasonably priced than the Majestic’s quality or atmosphere would suggest. The Majestic is one of those places that fits almost every occasion – you can go there in jeans or fancy dress, and the menu is varied enough to please most palates. It’s the sort of place that I think of when I’m not sure what I want to eat – it’s inevitable that I’ll find something on the menu that sounds good. 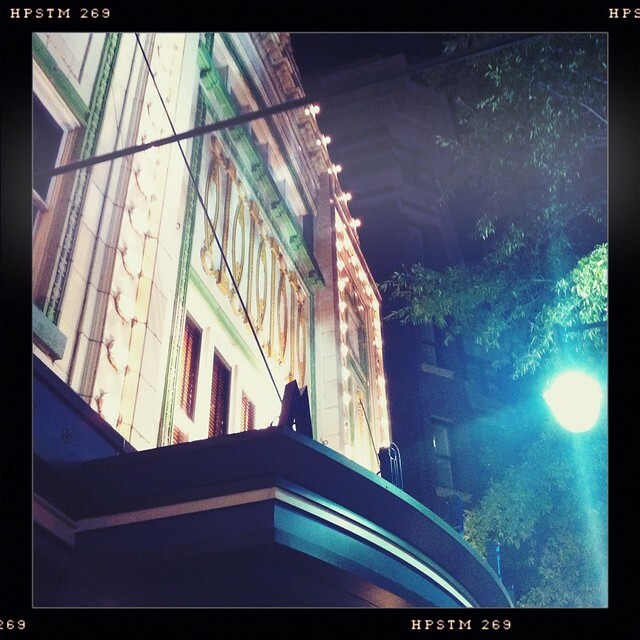 When my friend John and I couldn’t decide what we wanted last night, we wound up at the Majestic. 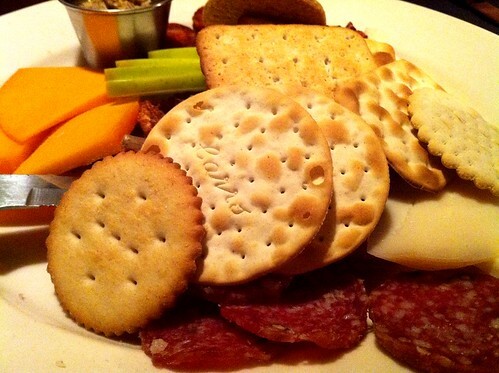 To start, we ordered the sausage and cheese plate. It was more food than I expected. The plate was piled high with crackers, two kinds of cured meat (some spicy sausage and some salami), mustard, spiced walnuts, greens, apple slices and two cheeses. When I was there, the cheeses were a mild cheddar and some kind of semi-hard tangy white cheese, but the selection changes daily. If you’re going to get this as an appetizer, I recommend having more than two people to share it. It was so good that the two of us killed the whole plate and were nearly full when our main courses arrived. 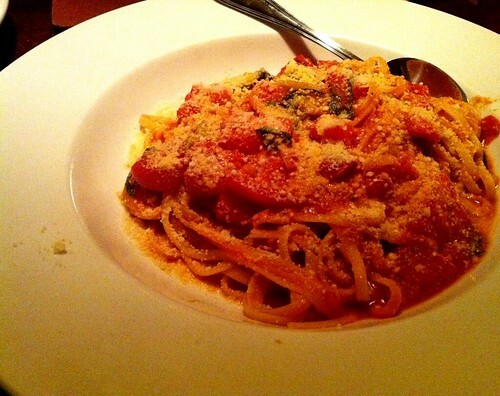 For dinner, I ordered the linguine pomodoro. I had been craving pasta all day, and this took care of the cravings perfectly. The noodles were al dente, and I loved the smoky tomato sauce. The pasta is vegetarian friendly – it comes with big chunks of tomato and fresh basil and is capped with powdery Parmesan cheese. The serving was bigger than it looked, so I wound up with a to-go box. My friend had the duck confit flatbread. The flatbreads are listed on the appetizer menu for sharing, but they’re big enough to make a good, inexpensive meal for one. My friend described this particular flat bread as “salad on a pizza”. He was kind of right – the crust was piled with caramelized onions, greens, duck meat and goat cheese. It was really good, but was nearly impossible to eat without a fork. 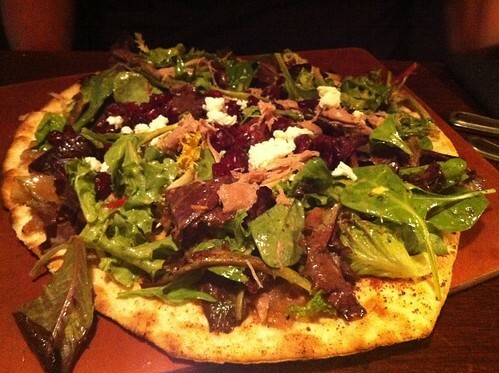 For those of you hesitant to try duck (as I was), don’t be scared – the duck on this flat bread was super tender. It almost had the consistency of really good barbecue. One of my favorite things about the Majestic is their desserts. After your meal, the server comes by with a tray of shot-sized glasses filled with dessert. It doesn’t sound like much, but the portion size (and price) is just right if you want a little something sweet. We tried the key lime pie and tiramisu, both of which were excellent. The Oreo also looked amazing. The Majestic Grille is open for lunch and dinner Monday – Saturday, and is open for brunch, lunch and dinner on Sunday. If the weather is night, request a seat on the patio – the people and trolley watching along the Main Street Mall is great. Absolutely LOVE The Majestic. Yum! One of the best concept dishes I’ve had.. everything works and is so delicious! Never been but plan to come soon with some coworkers.